First born, 1-day-old, 2.5 kg, male baby was admitted in the Department of Pediatric Surgery, with a swelling in lumbosacral region along with an intestine like structure overlying it. No other obvious congenital anomalies were detected. The antenatal history was uneventful. There was no history of drug intake, fever with rash and radiation during antenatal period. Baby was born on full-term, normal vaginal delivery. On clinical examination, there was a cystic swelling, well covered with skin, over lumbosacral area (meningomyelocele) and an intestine like structure was present at the summit of swelling (dorsal enteric fistula) [Figure 1]. There was also a paraspinal muscular defect (hernia) just superior to the swelling, which contained some solid tissue. The baby was passing meconium and urine normally and was moving both his lower limbs normally without any neurological deficit. Plain X-ray of the lumbosacral spine suggested complete splitting of lumbar vertebrae and sacrum. There was no sign of hydrocephalus on cranial ultrasonography. Computed tomography (CT) scan of abdomen and spine [Figure 2] revealed complete splitting of lower lumbosacral vertebrae, dorsal enteric fistula and posterior herniation of kidney as well. Peroperative finding was meningomyelocele along with dorsal enteric fistula which was non-communicated and attached to the sigmoid mesocolon. There was also paraspinal lumbar hernia which contained kidney and upper ureter. Neonate was well managed by excision of dorsal enteric fistula, closure of spinal defect and repair of posterior muscle wall after placement of kidney in retroperitoneal renal fossa as a single-stage procedure. The SNS, as proposed by Bentley and Smith,  (also known as posterior spina bifida, combined spina bifida, neurenteric fistula, and dorsal enteric fistula) is an extremely rare form of dysraphism (less than 25 cases have been described in the literature so far). It was first described by Rembe in 1887. Only one case was discovered in an adult and others were in newborn and young children and were reported both in males as well in females. It is a complex malformation, comprising vertebral anomalies (anterior and posterior spina bifida, butterfly vertebrae), central nervous system abnormalities (diastematomyelia, diplomyelia, myelomeningocele) and intestinal anomalies (fistulas, dermal sinus tract, diverticula and enteric cysts). The syndrome manifests as a cleft in the dorsal midline of the body through which intestinal segments are exteriorized (often with an associated fistula), myelomeningocele, and occasionally as a teratoma. The hydrocephalus and diastematomyelia/diplomyelia are a frequent association. However, babies do not necessarily present with functional spinal cord defects; in some reported cases, the motor function of the lower limbs is normal. The dorsal enteric fistula is due to persistent connection between the endoderm and ectoderm, resulting in splitting of the notochord. The fistula traverses the prevertebral soft tissue, the vertebral bodies, and the spinal canal with its contents. Any portion of this tract may involute or become fibrous, leading to a fistula or a cyst. The dorsal enteric sinus, a remnant of the posterior portion of the tract, has an opening on the skin surface. Dorsal enteric cysts are trapped remnants of the middle portion of the tract, found in the intraspinal or paraspinal compartments. The dorsal enteric diverticulum is a tubular diverticulum arising from bowel and represents a remnant of the anterior portion of the tract. Patients with dorsal enteric fistula present as a newborn with a bowel ostium exposed on the back. Intraspinal enteric cysts usually present between 20 and 40 years as episodic local or radicular pain that may progress to myelopathic symptoms. The location of the intestinal fistula may vary from case to case, and may be found either in the distal ileum/cecum or in the large intestine (most of the cases). The disease affects both males and females, and there exists a high incidence of urogenital malformations and anorectal malformations. 1. Philippe J. Split notochord syndrome. www.TheFetus.net Available from: http://www.thefetus.net/page.php?id=443.2003. 2. Jesus LE, Franηa CG. A rare variant of neuroenteric cyst: split notochord syndrome. J Pediatr 2004;80:77-80. 3. Agangi A, Paladini D, Bagolan P, Maruotti GM, Martinelli P. Split notochord syndrome variant: prenatal findings and neonatal management. Prenat Diagn 2005;25:23-7. 5. Asagiri K, Yagi M, Tanaka Y, Akaiwa M, Asakawa T, Kaida A, et al. A case of split notochord syndrome with congenital ileal atresia, the total absence of a colon, and a dorsal enteric cyst communicating to the retroperitoneal isolated ceca with a vesical fistula. Pediatr Surg Int 2008;24:1073-7. 7. Bentley JF, Smith JR. Developmental posterior enteric remnants and spinal malformations. Arch Dis Child 1960;35:76-84. 8. Akgur FM, Ozdemir T, Olguner M, Erbayrektar S, Ozer E, Aktug T. A case of split notochord syndrome: presence of dorsal enteric to the dorsal enteric fistula. J Pediatr Surg 1998;33:1317-9. 9. Kumakura A, Takahara T, Asada J, Matsukawa Y, Hata D. Split notochord syndrome with congenital unilateral Horner's sign. Pediatr Neurol 2008;38:47-9. 10. Sanders RL. 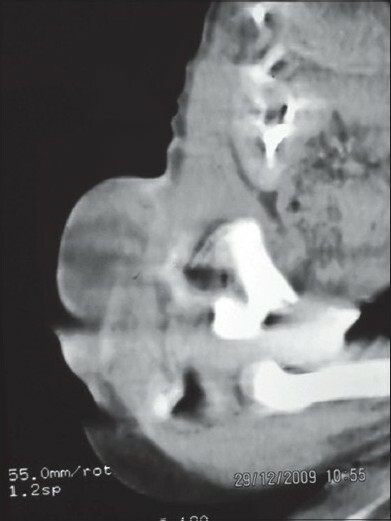 Combined anterior and posterior spina bifida in a living neonatal human female. Anat Rec 1943;87:255-78. 11. Alrabeeah A, Gillis DA, Giacomantonio M, Lau H. Neuroenteric cysts - a spectrum. J Pediatr Surg 1988;23:752-4. 12. Almog B, Leibovitch L, Achiron R. Split notochord syndrome - prenatal ultrasonographic diagnosis. Prenat diagn 2001;21:1159-62.